The cards have the answer. Give cartomancy a try! Most people have heard of tarot readings, but cartomancy remains somewhat under the radar. Similar to a tarot reading, cartomancy uses a deck of cards to help divine answers to your questions. Here's some information on cartomancy to help you understand what it's all about. 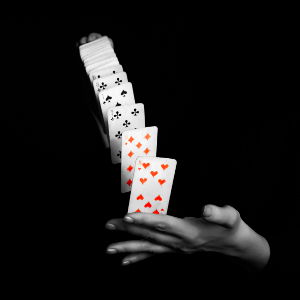 Before poker, gin rummy, and bridge, decks of cards were used for cartomancy. This surfaced as early as the 14th century. That deck of cards consists today of four suits, including hearts, diamonds, spades, and clubs, each with 13 cards. Experts in some countries use different cards, though. In France, cartomancers use a 32-card piquet deck, while others like to include blank cards and jokers. Just like with tarot readings, there are meanings associated with each card. Cartomancers lay the cards out in a spread, depending on what question is asked. Through training and skill, cartomancers can help you find answers by knowing which spread to use and what the cards mean together as a group. Cartomancy is very flexible, which means all questions can be answered, no matter how they are posed. This is done through the spreads that a cartomancer uses to help you understand the situation better. While the cartomancer is shuffling, he or she will ponder your question. This will bring to the surface the cards necessary to answer your query. Results can include a brief yes or no answer or something quite in-depth. Common spreads include the 3x3, seven fates, five card, and three-card spread. The 3x3 spread is a great option if you just need some insight into a person or matter that you've been considering. The seven fates gives an overview of your life in the future, including family, career, wealth, happiness, and romance. Five card is a great option if you have a question that requires a yes or no answer. Three-card spread allows flexibility. Depending on the question you ask, the answer could be past, present, and future, or it could be you, the other person, or the relationship. It's great for open-ended questions. Ace of Hearts: This card represents the homer. Depending on the question and position, it could indicate good news coming to family members or the start of a new relationship. Eight of Diamonds: This is the card of money. It represents unexpected money that is on its way or that it's time to budget. Queen of Diamonds: This is the card of gossip and can indicate a woman who is sophisticated, witty, decisive, and responsible. Nine of Clubs: This is the card of contentment, which could mean that you've completed a goal and that you are content. The next time you have a question and need some answers, consider getting a cartomancy reading. You may just find exactly the answer you were looking for.